On this full day private tour of Bali you will have an unforgettable experience. 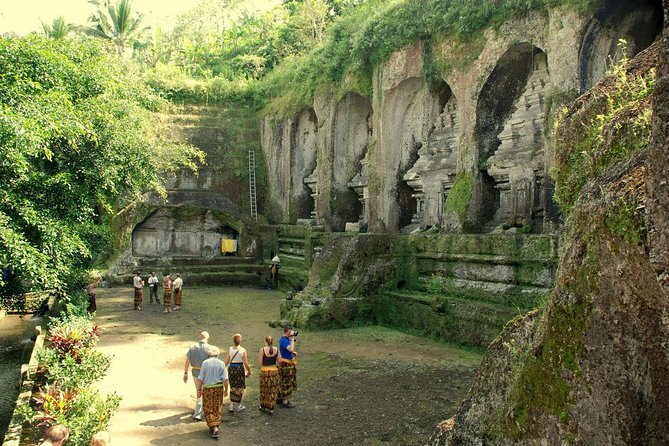 On your tour you will see ancient temples including Gunung Kawi with rock-cut shrines on the cliff face. You will also visit the Holy Spring Water Temple of Tirta Empul Temple. Your tour includes lunch at a local restaurant as well as a short trek to the rice terraces. You will finish your day with a stop at a coffee plantation followed by a visit to the Ubud monkey forest. Your private tour brings you to the centre of art and culture in Ubud, you will see how the local people live their daily life and make their creations. In this tour you will be invited to have a holy blessing at the holy spring temple for purification and soul cleansing. In the morning you will be picked up from your accommodation in your private vehicle and taken to Ubud. You will arrive at Gunung Kawi at 10:30am. This is an 11th century temple and funerary complex that is spread across either side of the Pakerisan River. It comprises 10 rock-cut Candi (shrines) that are carved into some 7 metre high (23 feet) sheltered niches of the sheer cliff face. Visit the Holy Spring Temple (Tirta Empul) at 12:30pm. Here you can have a holy blessing for purification. You will be provided with a Sarong to enter the temple as well as doing the blessing. Next at 1:30pm you will have a lunch at a small restaurant inside the jungle with views of the valley and rice terraces. After your short trek you will stop at a coffee plantation to taste the Luwak Coffee which is strangely digested through the Luwak. Visit a popular monkey forest in the centre of Ubud to see long tailed macaques in the green jungle before arriving back at your hotel at 7pm. This tour was great, especially you have limited time. Our tour guide Risma was very personable and knowledgable. Overall, a great experience. Highly recommend this tour! This was a great tour to show us places around Ubud. Our tour guide was very nice and knew his way around. I would recommend this tour to anyone who wants to experience Bali! Our guide was very accommodating. He picked us up from our Airbnb in Kuta and even dropped us off at our Airbnb in Ubud. He spoke good English and let us customize our tour. He also took pictures with his camera and sent them to us. Overall, a great experience. Highly recommend. This is a 'must do' tour for anyone who is short on time and is wanting to see some of the main points of Bali. I cannot speak highly enough of our guide, Gede. Pick up was on time, he spoke excellent english and adjusted our tour to avoid the busiest times at some of the 'attractions'. He also asked us for our preferences so we avoided seeing too many temples. He was very patient when we accidentally went for an extended mountain trek at the rice terraces and remained enthusiastic and informative even though he carried out this tour several times a week. Gede, you are a star, 10/10. Other reviewers have mentioned the various places visited so I will not. All in all, and excellent day tour. This tour was breathtaking! It would not have been possible without our phenomenal tour guide Made. He was helpful, patient, and a pleasure to have with my friends and I. He went above and beyond to make our tour meaningful. I highly recommend this tour. Aaron, our tour guide and driver, was very friendly and knowledgeable. He was very accommodating towards our schedule: we were picked up from our hotel in Seminyak then dropped off at our hotel in Ubud at the end of the tour. We learnt a lot about Balinese culture and history throughout the day. The Gunung Kawi and Tirta Empul temples were particularly impressive, thanks to Aaron's in-depth knowledge about the sites. The traditional Indonesian lunch included as part of the tour was absolutely amazing. It was by far the best meal we had during our week-long stay in Bali. To top it off the views from the restaurant were breathtaking perched in the treetops overlooking the jungle. Our tour guide was Panca and he was absolutely fantastic! He explained every little detail along the way and answered all the questions we had during the car ride to the various places we visited and also gave us many interesting historical details about each place. Every place we visited was just so beautiful and better than any picture you take. The rice terraces are just picturesque an serene and the monkeys at the monkey forest in Ubud, so cute. You can pay a lady a few bucks while inside if you want to feed the monkeys. They are everywhere, but they usually leave you alone unless you paid to feed them. We were warned to remove any hats or earrings we had on as they may take interest in those things and take them from you. The old trees and the surroundings in this sanctuary almost look like they were taken out of an Indiana Jones file, so green and alive. We also visited a few temples, Tirta Empul and Gunung Kawi. At Tirta Empul, you can go into the water and actually get a blessing for purification, you do have to pay extra to get into the water, so if that's something you plan on doing, be prepared and bring a towel and change of clothes. The extra that you pay includes a sarong and locker. Note that you do have to wear a sarong in all temples out of respect and they are usually provided with your entrance fee. My husband and I were not prepared so we weren't able to go into the water. The lunch included in this tour was amazing. So good and the restaurant had spectacular views. After lunch, we went to Gunung Kawi which is a temple and funerary complex. Sarongs are also included so beware of the local sellers telling you you need to buy one-you don't. The walk down to the temple is pretty long so be sure to wear comfortable shoes. This was also very beautiful and were able to hear and see the local men and women playing music and singing in ancient Balinese. Very lovely, we took a few videos of them. The way back up from the temple is quite a stroll so be prepared for that. After a long day, it can be tiring, but this whole tour was so worth it! If you come to Bali-this is MUST book tour. You will be very lucky if you end up with our tour guide, Panca-he's the best! This was both my wife's and my first trip to Bali and thanks to VIATOR Tours it has become a very memorable one for us. Our day tour was a private tour by an excellent guide Wayan Berata a Hire Bali Driver. Wayan collected us from our Hotel at the appointed time and with excellent English gave us a menu of local craft villages we may like to visit. We selected a visit to local art centre and were thrilled to have had a selection of excellent paintings at excellent prices without any necessity to buy. As we continued our tour Wayan answered honestly the many questions we had in relation to Bali and its local customs etc. The tour consisted a visit to a tea and coffee plantation, monkey forest, temples and the rice terraces - just as the tour descriptor stated. The lunch was first class and beautifully presented as we overlooked the rice terraces. At all times our guide was very professional knowing when to explain and when to give us time to reflect and browse about, all the time making us feel his special guests. We were exhausted when we got back to our hotel but with many positive memories of our day trip with Wayan our guide. This is a tour we could recommend to all travellers. John and Colette from Co. Cork, Ireland. This tour encompasses several key must sees of Bali, taking you by private car to all of them without having to bother about getting tickets, lunch etc We had Desna as our driver and guide and had a very good experience overall, him being very good natured and helpful. The rice terraces however proved to be a bit underwhelming, having to pay donations every five steps, could be exchanged for another temple or activity.